Some old bus stations in the centre of Leeds. When I was recently on Wellington Street I got to think of the bus station that used to be there. It struck me that there is no sign at all now that there was a bus station as the building that occupies the site was very well designed and does not stand out as an obvious 'new' building. It fits in so well that I've even had to look at a map to confirm where I thought the bus station was. Oddly I thought its name was the Central Bus station, being as it was more or less opposite the Central Station (train station) but googling Central Bus Station brings up lots of links to the current bus station of that name near Leeds Market. I presume its name must have been the Wellington Street Bus Station. I then thought of the West Yorkshire bus station on Vicar Lane and the Wallace Arnold bus station on The Calls. Though I don't recall it I know from having heard of it that there was a bus station on Rockingham Street that was lost in the building of the Merrion Centre. Without having to search through hundreds of links I have found it hard to readily obtain information and/or photos on the old bus stations in the centre of Leeds. I wonder if anyone knows of any books/websites that may have such things? If there are none then I think that for someone with more ability than me it could be a good historical record to produce a book/booklet. A bleak and windswept place if ever there was! One thing that did surprise me from the searching I did do was that the Wellington Street Bus Station was still in use to at least the late 1980s, as I would have guessed it closed much sooner. I have not yet been able to readily find the date when it and the other bus stations closed. Yes, I remember the Wellington Street bus station. The waiting room was just to the right of the first photo, in a draughty "bunker". Actually, looking at the following photo, it doesn't look like a bunker but was very draughty! 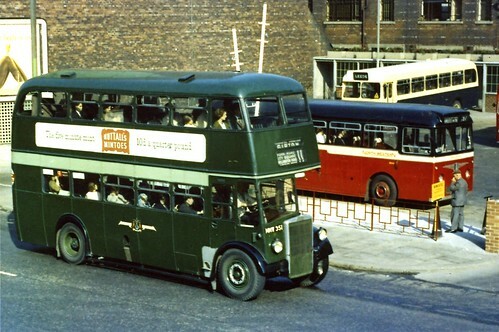 We used to call the Vicar Lane bus station the "Red" bus station, and the one on the present site the "Green" bus station because of the livery of the companies which used the stations. 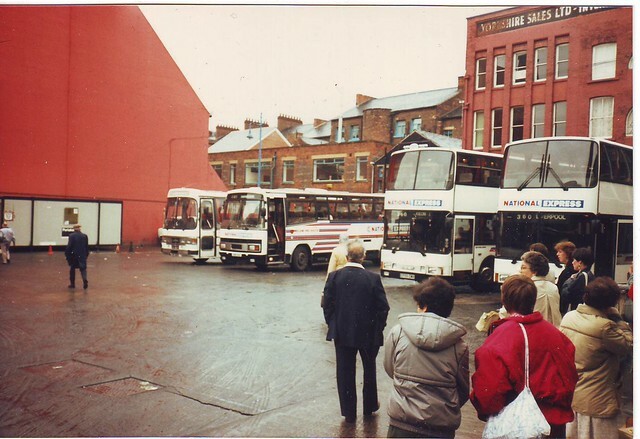 I used the Wallace Arnold bus station in the late 1970s but am not sure when it closed down. Does anyone remember the North Bar stone mounted on the wall on Vicar Lane outside the bus station? I often wondered what happened to it (the East Bar is still outside the Parish Church and the Burley Bar is in the Leeds Building Society). Yes, I remember that bus station. The waiting room was just to the right of that photo shot, in a draughty "bunker". I recall there was a query about the North Bar stone at the Vicar Lane site on SL about a year or two back and as I had not heard of that I had a look round the site but (if it was still there) I did not find the stone. It would be good to know where it is (hopefully it has not been destroyed). You couldn't call it a bus station, but the terminous for Yorkshire Woollen services to Dewsbury, Elland and Overton was alongside the Queens Hall on Sovereign Street. When I was a kid a lot of the Yorkshire Woollen Services and Hebble Motors Services used Wellington Street itself for services to Huddersfield, Halifax, Rochdale and Burnley. I also recall boarding services for Scarborough from Wellington Street - but not the Coach Station. I remember travelling on a rear entrance red single decker - Blakey will probably know who it belonged to. The cross should be where it used to stand. I think it closed late 80's early 90's Leodian. It was just at the top of the old staircase from Vicar Lane. Not sure we determined is remaining or removal.